This is because the recent Thimphu Dzongkhag Tshogdu (DT) decided to provide the funds directly to the dungkhag without having to route through the dzongkhag. 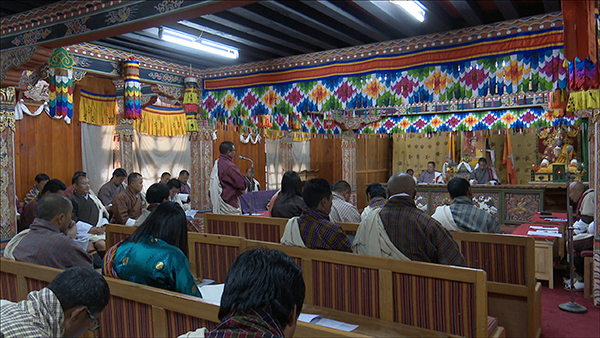 Until today, the entire dungkhag budget was managed by Thimphu Dzongkhag. Lingzhi dungkhag had proposed that the entire budget be released directly but the DT approved direct release of only capital fund and budget for public infrastructure maintenance. Lingzhi Dungpa Mani Sangye said the move would help in accelerating the progress of construction and maintenance works in the dungkhag. “It will enable us to give due importance to the deserving sectors and also, the dungkhag can be held accountable for any lapses,” the Dungpa said. Lingzhi Gup Wangdi welcomed the decision. For him, the move is a big step towards strengthening Lingzhi’s status as a dungkhag. “Until now, we felt like Lingzhi was a dungkhag in name only,” he said. However, Naro Gup Wangchuk is not happy about it. “It could benefit Soe and Lingzhi gewogs but for us, the earlier arrangement is better,” Naro Gup said. Naro is one of the three gewogs under Lingzhi Dungkhag. Its Gewog Centre is located closer to the Dzongkhag Administration than the dungkhag and that’s why Naro Gup says the earlier system suits his gewog better. “We will face difficulty in attending official meetings and completing other works on time because of the travel distance between the gewog and the dungkhag,” Gup Wangchuk said. The need to provide the budget directly to the dungkhag, along with the power to use it as per the needs of the people, was raised in previous Dzongkhag Tshogdus as well. But it was only this time the DT approved and endorsed the proposal. The dungkhag had also expressed a need for separate human resources. But it was decided the dungkhag will rely on the dozngkhag for manpower and technical support for the time being as the dzongkhag too is faced with manpower shortage. Lingzhi Dungkhag has three gewogs and is home to over one thousand people.